BlackRock (NYSE:BLK) shrugged off industry headwinds to report an earnings beat for the first quarter, as continued inflows into the the company’s popular iShares line of ETF offerings drove the top line yet again. Although the world’s largest asset manager had to contend with a decline in security valuations across debt and equity markets, it managed to report a small increase in its total assets under management (AUM) thanks to positive forex movements. We have summarized BlackRock’s Q1 earnings and also detailed the major takeaways from the announcement in our interactive dashboard for the company, the key parts of which are captured in the charts below. Although BlackRock’s operating margins for the period dipped noticeably for the quarter, the company continues to enjoy significant economies of scale compared to its competitors thanks to a huge asset base as well as its diversified geographical presence. We believe that this should help the asset management giant improve margins going forward despite industry headwinds, like the ETF price wars and the ongoing trend of investors shifting cash from high-fee active funds to low-cost ETFs. Accordingly, we maintain our $550 price estimate for BlackRock’s shares, which is slightly ahead of the current market price. BlackRock offers a complete range of investment products, including actively-managed as well as passively-managed (indexed) equity and fixed income funds, ETFs (iShares) and multi-class asset funds, in addition to currency, commodities, and other alternative investment funds. The company witnessed strong inflows for most of its fund classes over Q1 2018, with its long-term funds roping in $54.6 billion in net new cash. The iShares offerings were responsible for $34.6 billion in inflows – nearly two-thirds of total inflows. Notably, BlackRock reported net outflows from just two fund categories in Q1: active multi-asset funds and indexed equity funds. Continued inflows into iShares resulted in assets held across these ETF offerings growing to 28% of BlackRock’s total assets under management – up from 26% a year ago. While inflows over the quarter remained strong across fund offerings, there was a notable reduction in market value across asset classes which resulted in total AUM only increasing marginally from $5.84 trillion at the end of 2017 to $5.86 trillion now. The strong growth in BlackRock’s asset base over the years has led to a steady increase in its headcount – something that has understandably resulted in sequentially higher compensation costs. Additionally, the first quarter of the year saw BlackRock handing out annual bonuses to its employees, which elevated these costs further. Taken together with the fact that there was a sharp reduction in performance fees from weak market conditions for the period, this drove BlackRock’s operating margin to below 40% for the first time since Q1 2016. BlackRock’s effective tax rate for Q1 2018 was 19.5% – well below the average of 27% over the last five years. This can be attributed to the reduction in corporate tax rates under the U.S. Tax Act. 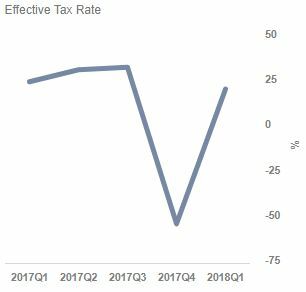 The unusually low tax rate for BlackRock in Q4 2017 shown in the chart below was due to one-time gains on its deferred tax assets from the implementation of the tax act.